Dubai, March 21: The Bharat Army, comprising of nearly 8000 fans of the Indian team from 22 countries, will gather for the upcoming World Cup in England as the Indian cricket supporter's group celebrate its 20-year anniversary. 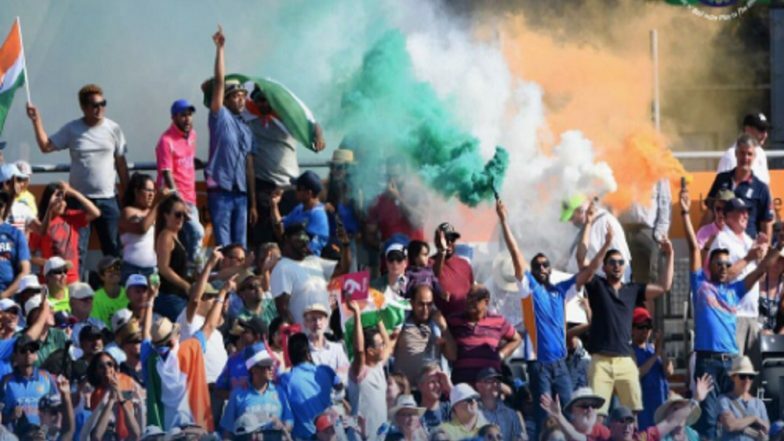 The group, which began with four fans from different parts of the UK, had been bumping into each other throughout the World Cup 1999 in England decided it would be fun to gather as many Indian fans together to watch the big clash between India and Pakistan and since then it has grown multi-fold, ICC reported. The Bharat Army has now grown from being a UK-based supporters' group to having a global presence with regional heads. [They] help grow our supporters' group in the UK, India, UAE, Australia, New Zealand and the USA," said Rakesh Patel, one of the founders. Patel, who watched Sachin Tendulkar scored 31 off 26 balls to help India to a five-wicket win at Trent Bridge in 1990, has been "travelling the world for almost 30 years" supporting India at different stadiums. Shikhar Dhawan and Yuzvendra Chahal Grove to the Tunes of Bharat Army After Clinching ODI Series Against New Zealand (Watch Video). "I've hundreds of ticket stubs and match-day programmes of all the matches I've been to around the world. Including that first match I saw live in 1990 at Trent Bridge, and Sachin's last match representing India - I followed his whole career like many Indians, so had to be in Mumbai to see his last moment," he said. Bharat Army Travel, an official ICC Travel and Tours partner, was set up in 2015. "Increasing demand of Indian cricket fans wanting to travel with us to major tournaments and series around the world. (We) expect circa 5000-6000 Bharat Army members at each of India's matches at CWC19. It's our largest presence to date," he said. The group have also organised an event called #BharatKeSaath in Manchester to commemorate the anniversary. During India tour of Australia, the Bharat Army received the team after they scripted history by clinching their first ever Test series on Australian soil. "It was actually the BCCI who decided they wanted to thank the BA for our support in 2018 across South Africa, England and Australia. They arranged for us to welcome back the team to the hotel in Sydney after the fifth day," Patel said. "As a cricket fan who has travelled the world following the team through good times and bad, this was surreal. I believe what defines our supporters' group is how we're valued by the team we support - so for the team to arrange this for us, and thank us for our support, meant a lot, not just to me, personally, (but also) to the members in that room that day and to all Indian cricket fans who have followed the team over the years," he added. India will start their World Cup campaign against South Africa on June 5 at the Hampshire Bowl in Southampton, England.